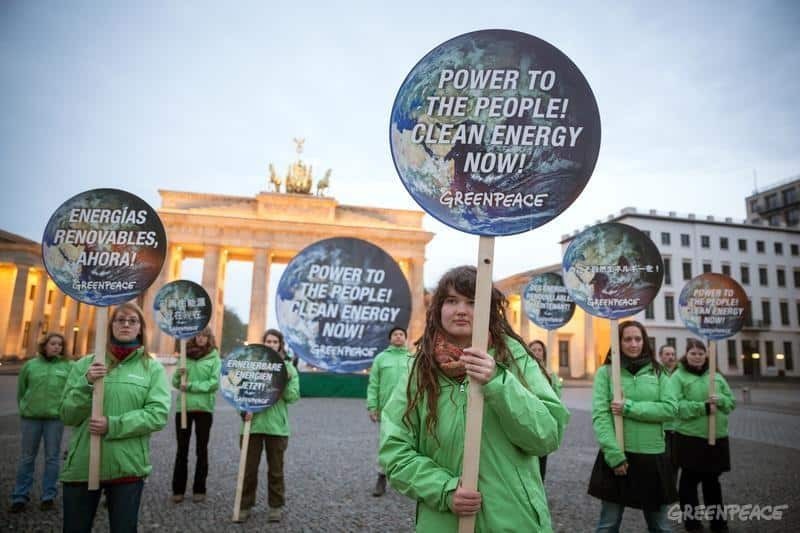 Greenpeace Germany activists demonstrated at Berlin's iconic Brandenburg Gate yesterday in a bit to urge governments and businesses to deliver “Power to the People – Clean Energy Now”. At the end of its week-long meeting in Berlin, the Intergovernmental Panel on Climate Change (IPCC) concluded that preventing catastrophic climate change requires an urgent and fundamental transformation of energy systems around the world. The Panel said that although global emissions of greenhouse gases grew faster between 2000 and 2010 than in previous decades, renewable energy has expanded substantially and its costs have now fallen so dramatically that it is increasingly ready to displace old, polluting forms of energy. Kaisa Kosonen, Senior Political Advisor at Greenpeace International, said: "Renewable energy is unstoppable. It's becoming bigger, better and cheaper every day. Dirty energy industries are sure to put up a fight but it's only a question of time before public pressure and economics dictate that they either change or go out of business. The 21st century will be the 'age of renewables'." More than half of the recent growth in carbon emission has been due to China burning ever more coal. But recent clean air measures signal the end of China's coal boom. China, the single largest emitter of greenhouse gases, has the potential to become the game-changer in international climate politics. Germany, which hosted the IPCC meeting, plans to cut its carbon pollution by 40 per cent by 2020.